Naturally based with modern scientific technology. Anti-Aging. 100% vegan. NEVER tested on animals. Sign up as a VIP, and receive 15% off, free shipping and more. 30 day money back. *** These products are made WITHOUT the use of synthetic silicones and waxes that coat the hair fiber artificially. They contain natural oils that mimic your body's natural oils, so your hair absorbs the nutrients immediately without the residue. Because of this, you will need to LOWER the temperature on your heat styling tools to ensure the integrity of hair fiber. Please use as directed. Products are very concentrated and a little goes a long way. THINK OF IT AS YOUR MAGIC MULTI-TASKING ELIXIR MY "LIQIUD GOLD"
Abyssinian oil was the first ingredient selected for its remarkable rejuvenating properties. Next, a blend of 13+ unique ingredients, including antioxidants, beta-carotene, and omega-3 fatty acids was developed. Thus REJUVENIQE® Oil Intensive was born. Think of it like replenishing your hair and scalp with much needed nourishment that tends to be removed through washing. Because REJUVENIQE® is compatible with the skin, it is easily absorbed without leaving greasiness. A little goes a long way, and with 101 different uses, I NEVER LEAVE HOME WITHOUT THIS! Also great for eczema or psoriasis. REJUVABEADS® selectively targets and mends split ends and other damaged or stressed areas along the hair shaft, eliminating breakage and frizz, decreasing friction, increasing shine and helping improve color. Independent testing has demonstrated a 100% mending of split ends 3mm long and under within one minute following application. Hair is left stronger, more flexible, manageable and resilient. The effects last for days (about two to three washes) and are enhanced with repeated use, without creating build-up, oiliness or heaviness. Leaves hair silky smooth, polished and protected from further damage. Work product through your hair from mid-shaft to ends. 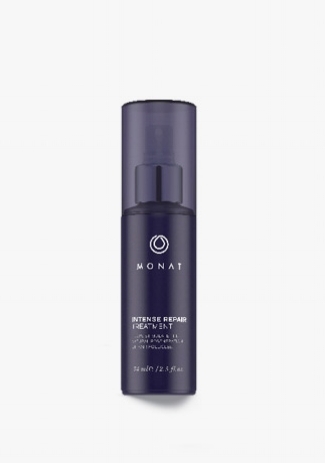 An intense, daily leave-in treatment for thinning hair that helps stimulate the scalp and boost the natural growth of thicker and fuller-looking hair. Its high intense blend of Red Clover Flower Extract, essential vitamins and active nutrients helps counteract the formation of DHT, factors that may contribute to hair thinning. Can be added to any system! After shampooing and towel-drying hair, spray on scalp—one section at a time—massaging in to ensure even distribution. For maximum results, use twice a day. Want a blowout that lasts without weighing your hair down or giving you a greasy feel? 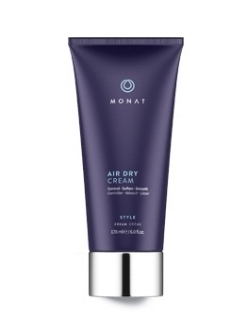 Now you’ve got MONAT’s Blow Out Cream that will give you a silky, smooth feel while restoring softness and shine! Importantly, it contains Dermafeel Sensolv, a natural silicone alternative that is 100% natural in origin. Say bye-bye to product build-up. Blow Out Cream also reduces styling time and conceals the signs of damage. Apply a pea to dime size amount to towel dried hair. A must-have in every woman’s arsenal, this product is great for those on-the-go. Formulated with agrana rice starch, our dry shampoo will banish oily roots and give you red carpet-ready locks. Plus, it won’t leave behind that pesky white residue you may experience with other dry shampoos (you know the one). It’s a win-win. Shake well before use and spray evenly 10 – 12 inches away from the hair, focusing on the roots. Let dry for 1-2 minutes; then finger comb or brush thoroughly. For extra volume use a blow dryer at the roots.